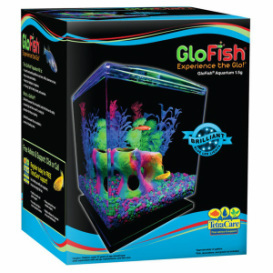 We offer the complete line of GloFish Blue LED Light Aquarium Kits. Please contact us for prices and availability. Have you seen GloFish® fluorescent fish yet? They’re the coolest thing to happen to fishkeeping since water! GloFish are beautiful and hardy fluorescent fish with the fascinating ability to absorb light and re-emit it. Originally bred so scientists could detect pollution in the environment, GloFish fluorescent fish are brilliant! They’re available in Starfire Red®, Electric Green®, Sunburst Orange®, Cosmic Blue® and Galactic Purple®. They look especially stunning under the special LED lighting in Tetra’s GloFish® Kits. Add a bright pop of light and life to any room.